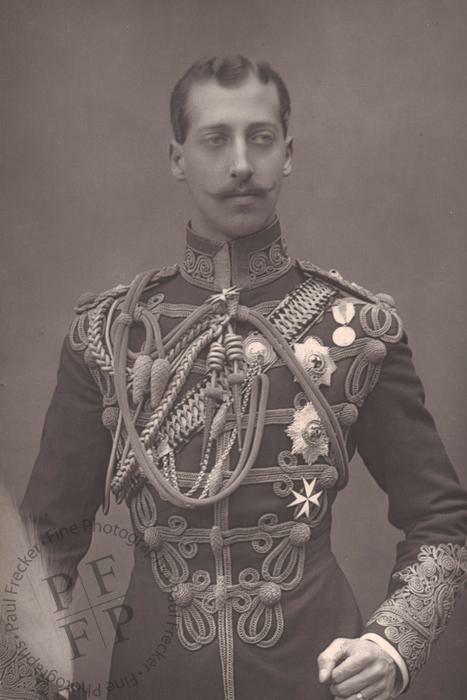 A Woodburytype portrait of Prince Albert Victor (1864-1892), Duke of Clarence and Avondale and Earl of Athlone, the eldest son of Prince Edward, the Prince of Wales and Princess Alexandra of Denmark, the Princess of Wales. Known as ‘Eddy’ within the family, he was second in line to the throne for all of his life. He and his younger brother Prince George served as naval cadets until 1883, after which Eddy was sent to Cambridge. In 1885, he joined the 10th Hussars Cavalry Regiment. Various royal princesses were put forward as prospective brides for the Prince. The first was Alix of Hesse, who did not return his affections (she later became the Empress Marie Feodorovna of Russia). The second was Princess Hélène of Orléans, who did return his affections but refused to give up her Roman Catholic faith. He eventually became engaged to Princess May of Teck, but died before the marriage could take place, aged only 28, of pneumonia at Sandringham on 14 January 1892. His fiancée married his younger brother George instead, and the two eventually became King George V and Queen Mary. Published as a Woodburytype in 1890 as part of the first series of The Cabinet Portrait Gallery. Condition: the print is in excellent condition. It is mounted on a piece of clean, stiff, firm card with printed caption and photographers’ details in the lower margin. Dimensions: the print measures 5.5” by 3.65” (14 cm by 9.3 cm) and is mounted with a buff-coloured border on an off-white page measuring 8” by 6.1” (20.5 mm by 15.4 cm).